Conceit: Pretty straightforward – Lizzie Bennet is a grad student in Communications doing this as her project, presenting her views in contrast to her mother’s. What starts out as documenting Lizzie’s opinions ends up getting involved in a whole lot of drama. Audience acknowledgement & interaction: High acknowledgement and interaction. Lizzie’s videos are very public and very popular in-universe. The story even takes from the audience quite a bit, responding to the multiple requests for Darcy, and even affecting the self-esteem of Lydia. Acknowledges the problems of putting your life and the lives of those around you on the internet, but how communicating with strangers can help to communicate with people closer to you. Are other perspectives integrated? : Other characters take over Lizzie’s blog or have their own side blog, and show the holes in Lizzie’s sometimes flawed logic. Inventiveness: This was pretty much the first literary web series, so inventing the whole art form definitely counts! Also, two words: costume theater. Quality of Adaptation: Lizzie Bennet Diaries, rather than being a straight point-by-point adaptation, streamlined the events to make sense for modern day – house parties become pub visits, estates become companies, problems with land inheritance laws become problems with student debt and bad economy. Characters only just sketched out in the original text are fleshed out, and Lizzie herself is not only the modern Elizabeth, but the voice of self-exploring 20-somethings everywhere.But my favorite method of adaptation was the new life injected into main themes of pride and prejudice. When the original book came out, the audience would have been surprised to discover, along with Elizabeth, the hidden depths of Darcy. But 200 years later, when “Where is my Darcy?” is the common phrase among Austenites, no one is surprised Darcy is better than he seems. So, Pemberley Digital brought back the element of surprise by making Lydia Bennet, an irresponsible flake in the original book, the one truly misunderstood by Lizzie (though dear Darcy still plays an important role). The only thing maybe lost in adaptation is the fact that, in the original book, Lizzie was more right than wrong, whereas in the web series, she seems more wrong than right. Additionally, the generational/power conflict emphasized by Elizabeth’s encounter with Lady Catherine de Bourgh in the book does not quite translate in Lizzie’s confrontation with Caroline, as Lizzie and Caroline are peers and Caroline does not have nearly as much power over Lizzie, thus Lizzie standing up to her is not as big a deal. On the other hand, perhaps a figure such as the original Lady Catherine cannot exist at full power in a modern adaptation precisely because American society does not have the same rigid, blood-based hierarchy as Regency England. Conceit: Emma Woodhouse is documenting her greatness in lifestyle excellence as head of the consulting firm Emma Approved…eh…it does fall in line with the character, but some see it as over-the-top. Audience acknowledgement & interaction: Emma’s videos, except for the Q&As, are private. But she has cameras on the desks of everyone who works there (to the consternation of some of them). I think this is where a lot of fans got lost, because the audience didn’t affect the story the way it did before. Are other perspectives integrated? : Swiveling to other people’s desks helps. Also, Harriet has a music blog which often reflects her mood and her growing confidence in herself. Inventiveness: Month-long arcs of consulting clients in an office setting. More space, multiple rooms, in-universe charities made real. Quality of Adaptation: I love the way the characters were adapted, on one hand. The themes of appearance vs. true character are even more apparent in a web series format, where often charisma rules the day. Emma starts out ingratiating, but we really root for her by the end. Knightly is as lovely as ever, but now with more of a sense of humor (also helps that he’s not above get this time around). Harriet no longer stands in Emma’s shadow and grows beyond a project to a true friend. The supporting characters are all well-sketched and memorable, with the addition of LBD’s Caroline Lee as the infamous Mrs. Elton an incredible twist. The resolutions of the main pairings (Emma/Knightley and Harriet/B-Mart) were extremely satisfying, almost more so than the ones in LBD!On the other hand, the adaptation of the story at times felt choppy. The month-long arcs of each character getting helped by Emma wasn’t quite organic, and didn’t quite fall in line with the format of the original book, and by keeping the action confined to the offices, it has been argued that an element of the story and characterization – mainly Emma’s interactions with her neighbors and her father – is lost. So, as an adaptation, it may not be the strongest. Still, it’s an enjoyable, inventive adaptation. Are other perspectives integrated? : Sometimes other people find the camera, or don’t realize that Jane left her camera on somewhere. Mostly, however, this is Jane’s story, and she tells it well. Inventiveness: Outdoor shots, not afraid to get downright creepy, meta-commentary episode of Mary Rivers watching all of Jane’s videos. Quality of Adaptation: Jane Eyre is a pretty weird novel, by modern standards, and a problematic one, what with its shortsighted treatment of race, mental illness (the half-Creole Mason family hinted as being somewhat crude and prone to mental illness), and culture (Adele and her mother are put down for being French), and it’s arguably unhealthy relationships (since Rochester is kind of a jerk who has slept with a lot of women, and St. John is… well… Jane’s cousin). So I’m glad a lot of this is either removed or approached with more sensitivity, while preserving much of the darkness of the original novel. However, the adaptation does lose a bit of the supernatural element that makes the original a gothic novel, and since Jane isn’t facing nearly as steep of odds in terms of her class and gender, she’s as a result a somewhat softer character. But she is nonetheless strong and principled in the face of going it alone, and her story of finding a place and people to belong to is just as fulfilling as the original. Though the ending may feel rushed due to circumstances beyond the show’s control, overall it’s a strong modern adaptation. Conceit: Frankie Price (formerly Fanny) is vlogging for her brother in the Navy to stay up-to-date. Kind of like Vlogbrothers, only smaller… much smaller. It works for a shy character like Frankie, and has the added benefit of giving her a voice where other film adaptations have difficulty producing her interior life. Audience acknowledgement & interaction: In-universe, Will seems to be the only one who watches, whereas actually this show has hundreds of views. Are other perspectives integrated? : Other people often take over Frankie’s blog, even when she’s there, since she’s more quiet than others around her. Inventiveness: Outdoor shots, more personally focused (since it’s only for Will), British! Quality of Adaptation: This series is still in progress, but in terms of where we are so far, a lot of great stuff! Mansfield as a hotel rather than an estate makes sense in terms of the reputation associated with the Bertrams as a result, and gives the opportunity to present the Crawfords as interior designers rather than just random visitors. Having Frankie’s mother as an old friend of the family rather than a relative holds Frankie to the same indebtedness as in the original, without the whole “she marries her cousin” thing. And the most recent arc of Lover’s Vows updated to a raunchy amateur film makes perfect sense. Once again, a lot of the problematic elements have been smoothed out as a result of modernization.But interestingly, many of the characters in this version are quite a bit softened, perhaps so as not to have Frankie be a product of abuse like Fanny. The Bertrams are generally kind, if slightly dismissive, of Frankie, rather than outright cruel, though Edmund still understands her the best. And Mr. “Rory” Rushworth, rather than just an awkward old rich guy paired with Maria Bertram for reputation’s sake, is awkward in a more adorkable way, genuinely caring for Rhea and heartbroken to see her drifting from him due to Henry Crawford. In this way, Rory becomes an interesting parallel to Frankie, as she too is watching someone she cares about drifting away due to the Crawfords. As for Frankie herself, having her on camera does wonders for her relatability. In the original book, we mostly see Fanny overshadowed in social situations, rarely getting the chance to be her true self due to her station and Mrs. Norris’s machinations (I do miss Mrs. Norris as an actual presence, if only because she’s so fun to hate). But Fanny always showed passion for certain things, and opened up around Edmund and Will. 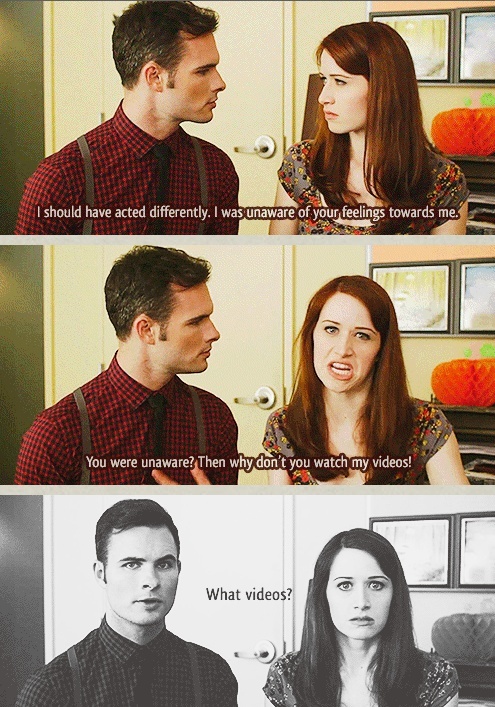 By having Will as a more constant presence as Frankie talks to him through the videos, the audience sees Frankie more often as her true self, in contrast to when she is overshadowed by the horribly awkward situations of people around her (such as being caught in the middle of Henry subtly seducing Rhea) . But even then, her frustration and sadness is clearly expressed by the actress, making Fanny/Frankie Price no longer the dull unfavorite of the Austen canon. As someone who always liked Fanny, it’s a major relief, and I hope this series continues to be awesome! Audience acknowledgement & interaction: So far, not much audience interaction, so these might not be public in-universe. Might be Q&A in future? Are other perspectives integrated? : Videos alternate between Mary’s blogs and scenes in her life. So far, no videos without Mary in it, but we do get out of her head a bit. We’ll see if any other characters end up vlogging! Inventiveness: Gorgeous use of outdoor space, mixes traditional and new media storytelling. Quality of Adaptation: Thus far, this seems to be the most far flung from its original, in part due to the massive age difference for the characters (10-year-old Mary and Collin are now teenagers). Mary is as sharp tongued as ever, but now takes to smoking behind the housekeeper’s back. And Collin… Collin is turned into Callie, female, diabetic and hinted to be so full of social anxiety that she never leaves her basement-bedroom. It makes sense that the illness keeping Callie inside was changed from the original, as a hunchback can be corrected more easily these days than in 1910, but if social anxiety is in play, it will be interesting to see how the writers plan to ease her out of it. Additionally, in this version the cousins don’t meet for the first time after Mary has been orphaned – they played together as kids. Mary is thus not delighted to discover her secret cousin, but instead angry with everyone involved in keeping Callie’s presence a secret… including Callie herself. Clearly Misselthwaite is willing to make big changes, but so far it hasn’t been for the worse, so we’ll see where it goes from here. So, what do you think? Do you think these web series capture the best of the books they’re based on? Got any other examples you want to talk about? Glad to be back, if a little late. Please read my last post for explanations as to why I was gone so long. Learn more about the blog here, about me here, and resources here. Check me out on tumblr at kateeorgera.tumblr.com, on Riffle at https://read.rifflebooks.com/profiles/119389 . Next Article What Makes a Good Literary Web Series? I have only watched LBD from the entire list and I do plan to watch Emma Approved, which is why I didn’t the entire post in detail (spoilers!) but the LBD part is so amazing! You’ve done a great job talking about web adaptations here and made me want to go start watching Emma Approved immediately. Thanks so much! I’m glad you liked the LBD analysis, but yeah, I guess I did get a little spoiler happy for people who haven’t seen the other series. I will say, for a spoiler-free version of my EA analysis, that I enjoyed how they adapted the characters, but the adaptation of the events of the book sometimes felt uneven. So it takes some time to get into, but the payoff is definitely worth it! 🙂 So I hope, whenever you get around to it, that EA satisfies you.